For all these years since we moved, we have basically ignored the foyer and first-floor hallway. In fact, we have never painted it. Why? 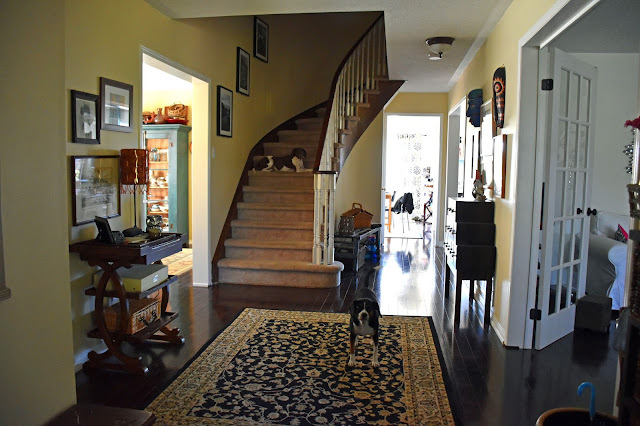 Mostly because the foyer leads to the staircase, which leads to the second floor, meaning there's a nice high wall over the staircase that needs to be painted. So we just avoided it. And we pretended it all looked okay. But it really doesn't. We've spent some formative years as a family tromping through this foyer, wearing flip flops, shoes, rain boots and winter boots. Not to mention those wet doggy paws. The taupe-yellow wall colour has become a source of irritation for me. The standard builder trim is dinged up and dirty. And the front door (which we hope to replace next year) is still its original shade of boring white. 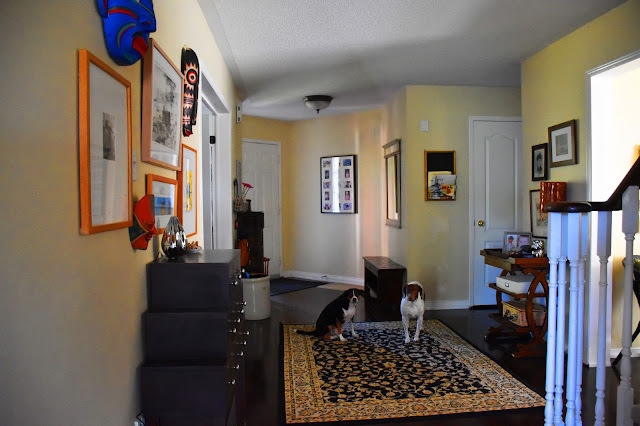 You can see that we have a fair amount of space to work with and there's a lot going on in it currently - plenty of pictures, storage cabinets and doorways to other rooms. Now that our family is older, with a preteen and a teen, I think it's about time for a fresher, more sophisticated look. When we (and visitors) enter our home, I want it to look clean, bright and calming. This foyer makeover would not be possible without the help of these sponsoring companies, each of whom supplied (gorgeous) product. All opinions are authentic and my own. Thank you for supporting the awesome companies that partner with Woman in Real Life. *This post contains affiliate links. If you make a purchase after following these links, Woman in Real Life may receive a small commission. Your price is not affected. Can't wait to see it at Christmas! Did you bribe the dogs to pose? Nice pictures. Actually I couldn't take a picture without them in it. I'm not even kidding. No matter which way I would turn they would get in front. that's a nice lot of space for a foyer! How exciting to be doing a reno. Looking forward to your after pics! Yeah, I guess it's basically breathing space, because it really doesn't need to be that big in terms of function. Thank you! Can't wait to get to the "after"!!! Can't wait to see the final look!! I'm trying to bring in sapphire blue and teal more into our living room as so far it's mainly shades of brown. 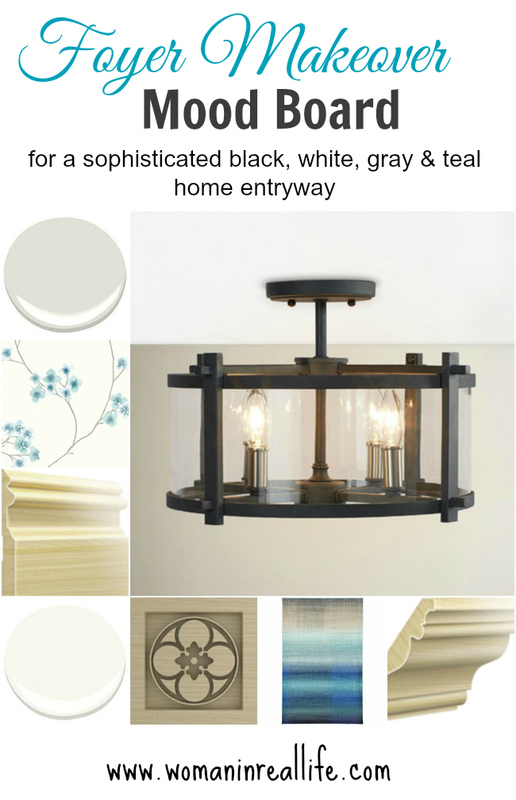 Love your color scheme -and the size of your entry! this refresh is JUST what the space needed! and it'll transition so well into the rest of your home. I'm excited to watch it all come together! Thank you Meagan! We're looking forward to the end result. Looks great- I love the wallpaper! I must say I like the colours of your before but am looking forward to seeing the reveal! I'm a bit of a turquoise freak, so I really like the colour palette you've chosen for the foyer. Can't wait to see the result. You have a lovely home, looking forward to seeing the "after" reno pics. What a beautiful home! Love the style! I only use Benjamin more paint in my home. Thanks for your kind comment Karla. I love your mood board, everything is so well thought out. I really think the wallpaper is going to look great on one wall. Can't wait to see how it turns out. Thanks Melissa! I'm excited about it. Amazing! 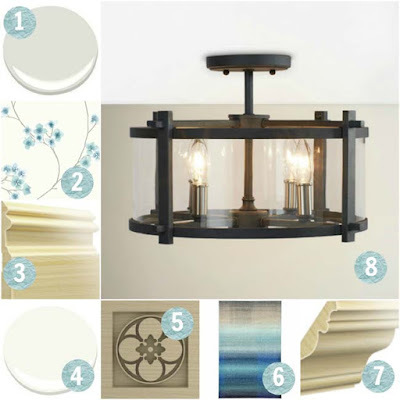 I'm a huge fan of Wayfair, and Benjamin Moore is my go to paint brand! Wayfair has a lot of tempting goodies for sure! And Benjamin Moore is a reliable choice. Thank you! I will definitely post pics. Thanks Judy! I can't wait to see the end product. 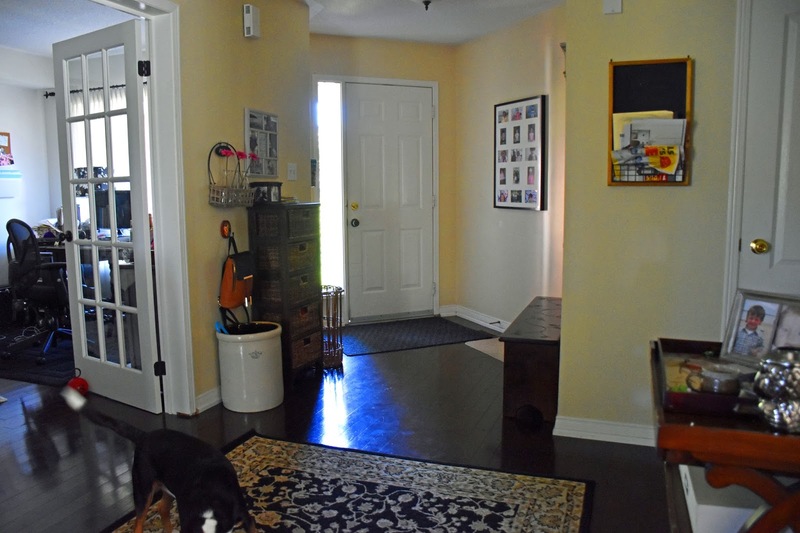 The ideas look much more calming which is what you need for the foyer. Exactly! More calming...and clean (hopefully)! Thank you. Love this vision board for shifting the energy of a room! Looking forward to seeing the results! Shifting the energy - I like that way of looking it! I love how you are bringing it all together! Your vision looks fresh & bright! I think it will definitely update the space & make it more modern. Fresh and bright is just what we were going for! Thanks Krista. I love the vision board. Great idea. Love your roomy foyer, mine is so small. I love the ceiling light (#8) that you have picked out. I can't wait for you to show an update!